"Ajya Mistry And Sons " Introduces Programmable "Automatic Office / Spring File Creasing And Hole Punching Machine". This machine makes creasing lines for office or spring file And Hole Punching , And Corner Cutting automatically. Creasing distance is adjustable through digital control panel. This machine doesn't require any mechanical settings for adjusting creasing distance or hole distance. Main feature of this machine is ' this machine can make creasing lines on any GSM of File Board with quality. This machine can be customize to suit individual requirment. 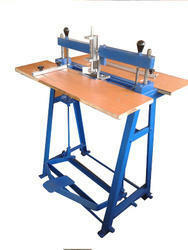 We are the manufacturer of Fully First Indian made Automatic Wiro Cutting, Inserting and Closing. This Machine helps to reduce waste of wiro. It cuts wiro only as per book hole quantity. It reduce the labor cost of cutting wiro , inserting and closing since it can work faster than manual work. Main feature is totally Indian Made machine with International standard automation components. Reel To Sheet Cutting Machine with Full digital control panel for Length setting without changing any gear or mechanical part. Product Length cutting change over takes few seconds and highly accurate in length cutting. Available in numerous specifications, the proffered machines are set up with servo motor for precise and fast feeding. Features: Longer working life of harden Knife Digital Control Panel for Feed and Speed Setting. Available From 18" to 60" Width. 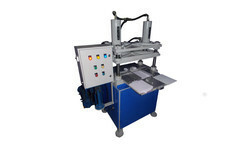 Special Machine for Cut to Register for Printed products. Fitted with Latest Sensors for high quality accurate out put. Machine with Multiple Slitting and Cutting Options are also available. Machine is able to slit and cut big width reels into small size sheets.Machine also available with different options for sheet collection like continuous collection, count and disburse etc. Slitting and Rewinding Machine for All Roll to Roll Cutting and Winding. Our Machines are design to suit individual Customer requirement. Slitting and rewinding machine for cutting big rolls into Small rolls. Light duty and heavy duty models. Models based on working area of 30".45",60".80". Well grinded and hard chrome plated rolls. Shearing, razor blade and pressure cut type cutter arrangement available. Customize to suit customers need and productivity. Rigid cardboard Box V Grooving Machine is the latest equipment we have added to the our wide range. Two Models available 24" And 36" based on Working Width of Sheet. Machine specifically design for Box Makers, Book Binders and Other card board product Manufacturers. This Machine makes V groves for folding by removing V type material from the cardboard or MDF Board and makes V grove for folding the card board at perfect right angle with good finish at bending. Machine can make two groves at a time with two cutter holders. Machine can be used with four cutter holders at a time also. Machine Runs on 1 HP three Phase electric Motor with Speed control panel. Also We have Automatic Feeding Holt Melt Gluer, Four Corner Taping And Box Spotter Machine with Box Pasting/ wrapper. We are working on complete Automatic Rigid Box Manufacturing Machine and it is available at very competitive rate compare with any other Machine around world. 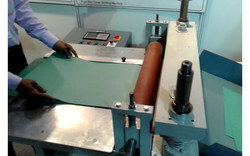 This is a newly developed machine for envelope cutting. With this machine we have given customer options of using traditional die set as well as One adjustable die sets for different sizes of envelopes. Machine has two cylinder design for better cutting capacity. Harden Four pillar design gives its good balance for cutting and also increases its accuracy of cutting. 20 Ton Cpacity machine with hydraulic power pack unit. Full Metal platform also with sliding type aluminium platform. Gauges for envelope cutting gives good control over job repetability. Established in the year 1967, we, Ajya Mistry & Sons, Mumbai, are one of the trustworthy manufacturers, traders, suppliers, importers and exporters of an unlimited compilation of Stationery Processing Machines. Our product series encompasses Collarband Cutting Machinery, Spiral Binding Machine,Wiro Binding Machine, Roll To Sheeter, that is manufactured from supreme quality raw materials that are obtained from our trusted and dependable vendors across India and World. Since our inception, we have focused on proffering supreme quality products to our clients and to make sure of the same, we follow the existing industry standards, while production of our range. We are backed by a Best infrastructure that is equipped with multiple machines and equipment that help us with the obstruction-free production & storage of the proffered machines. Because of the sincere efforts of our workforce, we have earned a vast number of customers, in the market. We import some raw Materials from Korea, Italy,Germany,Taiwan and USA, while our assemblage is exported to Africa, Asia and North America.